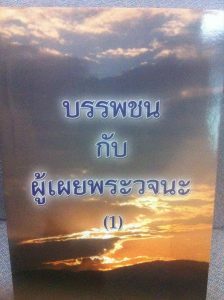 วางใจในคำสัญญาของใคร Trusting in whose promises? Your experience is that of many thousands of sincere Christians, but it is not real Christian experience, because it is not the experience of Christ. He “was in all points tempted like as we are, yet without sin.” It was not because He was of a different nature from us, for inasmuch as the children were partakers of flesh and blood, “He also Himself likewise took part of the same” (Heb. 4:15; 2:14), and in all things was “made like unto His brethren” (vs. 17). Like you He, “in the days of His flesh,” “offered up prayers and supplications with strong crying and tears unto Him that was able to save Him from death,” and He “was heard in that He feared” (5:7). He trusted in God, not in Himself. His words were, “I have set the Lord always before Me; because He is at My right hand, I shall not be moved” (Psalm 16:8). ​Instead of promising the Lord that you will not yield again, you must take His promise that you shall not. Your mistake has been in trusting your own promises instead of the Lord’s promise. It is by the “exceeding great and precious promises” of the Lord that we are made “partakers of the divine nature, having escaped the corruption that is in the world through lust” (2 Peter 1:4).